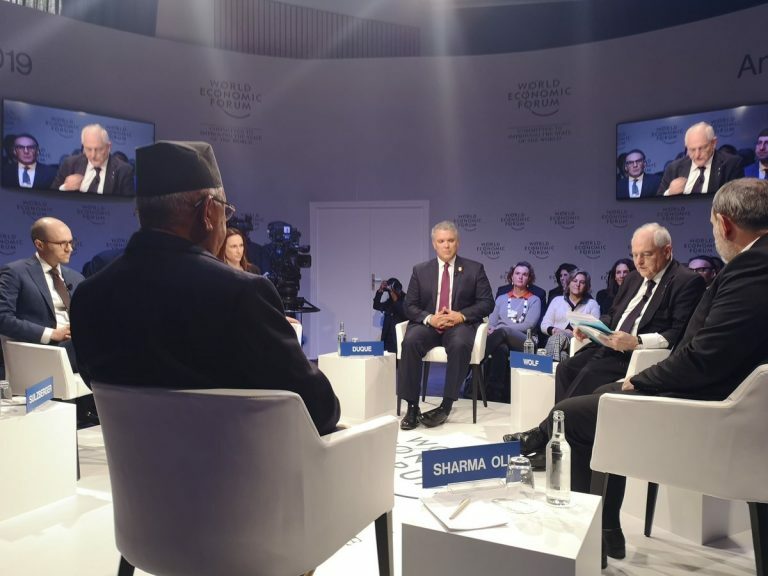 Davos (Switzerland, 23 January 2019 23) – Prime Minister KP Sharma Oli has said Nepal is a country that believes in democracy and where everything is under the Constitution. “We have brought tremendous changes in the field of democracy by abolishing an autocratic system to establish a federal democratic republic,” he added. In regards to relation with the press, Prime Minister Oli said he has normal relation with the press, as in democracy there is always need for normal relationship. “In autocracy, media is controlled to praise the rulers but in democracy they criticize, which is normal”, he added. The Prime Minister noted that yellow journalism however was not good, it disturb the things and misleads the people. “In the name of press freedom, if somebody gives false news and hurts others and damages other’s family life, prestige and business then it is not good”, Prime Minister Oli said. Other speakers in the panel were President of Colombia Iván Duque Márquez, American journalist Arthur Gregg Sulzberger, Prime Minister of Armenia Nikol Pashinyan and Founder and CEO of the Leadership Now Project Daniella Ballou-Aares. The session was moderated by British journalist Martin Harry Wolf.